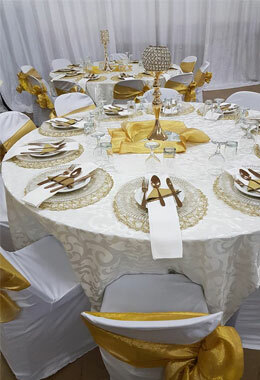 KMS Function hire and Events Planning started in 2008 by Sally Maharaj, it is a family run business. Located in Winchester Hills, (South of Johannesburg) KMS Function hire and Events Planning offers a range of services from full function hiring, décor, catering service and events planning. We do full walk in Walk out functions. We take care of your full co-coordinating needs. From Humble beginnings the business grew to be one of the most respected and popular function hire by repeat business from same clientele. We continuously strive for excellence, and emphasize on quality and customer service at all times. Although we are based in the South of Johannesburg, we service clients as far as Pretoria, Randburg, Sandton, Roodepoort and all surrounding areas in the South. Most of our business comes from word of mouth. We know your event or function is important and needs to be smooth flowing at all times, therefore we are here to ensure your function goes on without any hiccups.